From the Archive: A British Television Blog: Missing episodes of Doctor Who found! Breaking news from Missing Believed Wiped held today. 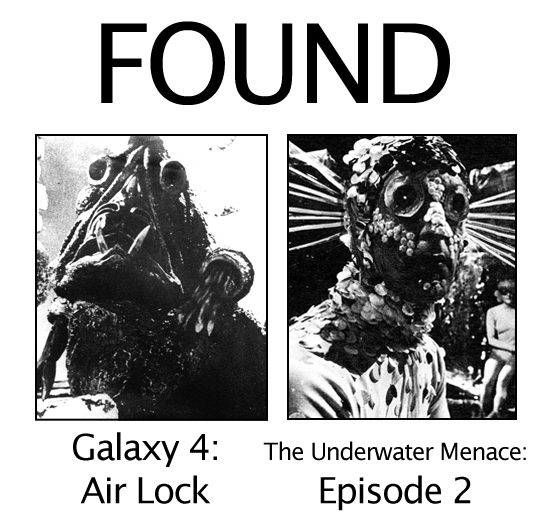 Two episodes of Doctor Who returned: Galaxy 4: Airlock & The Underwater Menace: Episode 2. I have not heard any information yet on how these episodes have been found or the stories behind how they survived all these years. Do you want to see a minute of a clip from each episode? Two classic episodes of Doctor Who - thought to be missing forever - have been returned to the BBC archive. Episode 3 of the William Hartnell adventure "Galaxy 4" and Episode 2 of Patrick Troughton's "The Underwater Menace" were purchased by film collector Terry Burnett at a village fete near Southampton in the early 80s. He had been unaware that the canisters contained material missing from the BBC. Thanks to the kind loan by Mr Burnett, the classic footage has been shown today at the British Film Institute's annual "Missing Believed Wiped" event at the National Film Theatre in London. Host at the event was Doctor Who writer and actor Mark Gatiss who said: "Christmas has come early for Doctor Who fans everywhere. It's always wonderful when a missing episode turns up but it's been years since the last one so to have two is just brilliant. Add to that a proper bit of action from the legendary Chumblies (and the horrifying Rills!) plus the utterly mesmeric Patrick Troughton on great form. Well, what more could we all ask for?" 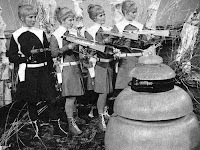 None of the four episodes of the 1965 adventure "Galaxy 4" were known to have survived, although a short extract had been retained. 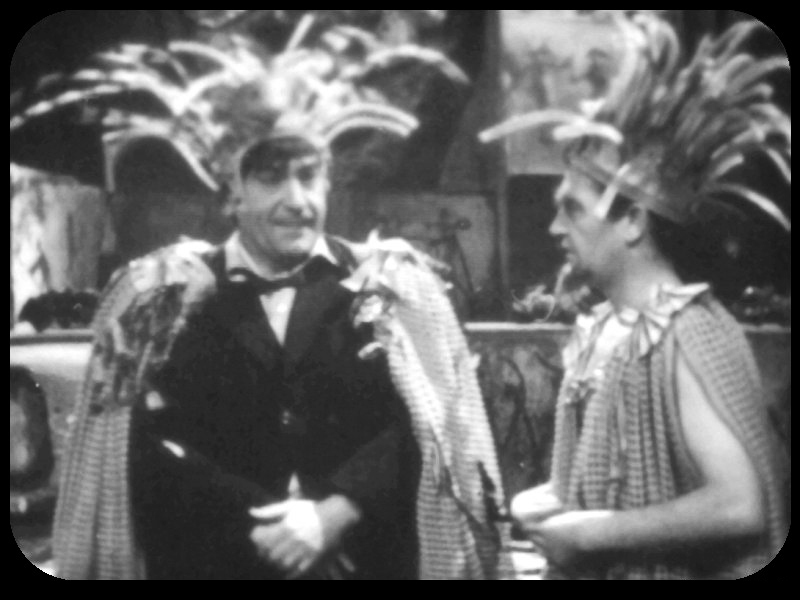 "The Underwater Menace" dating from 1967 is now the earliest surviving complete episode featuring Patrick Troughton's performance as the Second Doctor. Research has shown that the returned episodes originated from the ABC channel in Australia. In fact, the copy of The Underwater Menace is still missing a few short sections which were removed by the Australian censors upon its original transmission Down Under. Fresh scans of the missing material have been made by the National Archives of Australia and will be incorporated into the restored episodes ahead of a DVD release. Earlier today, forums became alive with rumours of episodes coming back including episodes from The Wheel in Space to The Space Pirates. What is interesting is that from the beginning, I heard the Galaxy 4 episode was definately one of them. "It's Rilly Drahvin me mad waiting for news of these 2 newly found Who episodes. I just Fish People would let us know. I Amdo excited! " Expect a youtube report from me this evening on certain #DoctorWho rumours. At this point they sound decidedly fishy. Christmas has come early for Doctor Who fans. Expect us to tweet some very - no REALLY exciting news in just a couple of hours' time. The finding of Doctor Who episodes The Underwater Menace-2 and Galaxy 4-3 has been announced at Missing Believed Wiped at the NFT. Hurrah! More info to come as I get it. Please check back. Greg you need to post more about the missing episodes of Doctor Who more often its seems like have you good luck. Strange coincidence just a few weeks later after your post they popped up. While not the Holy Grail of episodes I wanted I will still take them. I was thinking that too. Since I wrote the article, these 2 episodes turn up and also the Oswald the Lucky Rabbit short turns up too. All I want for Christmas is The Tenth Planet 4. Oh, and all the other missing episodes. I promise I have been good! As I am kneeling next to my bed, hands clasped ready to pray, "Dear Santa, please give this man Dave what he asks for! He's been ever so good!" And a Massacre of St Bartholomew's Eve. There's definately more episodes still out there. These two turning up in 2011 proves that! Some employees at the BBC helped themselves to 16mm film cans that were about to be junked, and as soon as word got around this became regular practice. Sadly that practice itself wasn't documented, making it now a tough task of trying to find out who those employees were and where they live now!